This penthouse condo has two bedrooms and two bathrooms, with plenty of bedding for larger parties. It is conveniently located across the street from the ski base area, and is directly on the bus route. While you stay here, you will have easy access to all the mountain area activities, restaurants, shops, and world-class mountain biking, zip-lining, miniature golf course, and much more! This condo can accommodate small or large groups, and good pets will be considered (additional pet fees apply). The amenities include a washer/dryer, wireless internet, and a flat screen TVs. There is also a garage that can be used to store bicycles, dirt bikes, and other fun summer toys! The master bedroom has a king bed, the guest bedroom has a double bed and a twin bed, for a maximum sleeping capacity of 5. There are two decks off of the living area that offer great views of Mt. CB as well as a great cross-draft for warmer summer nights. For those that rent during shoulder seasons, there is a cozy fireplace to warm up the chilly nights, both in the Great Room and the master bedroom. The vaulted ceilings give a more open, larger feeling to the space, and provide spectacular views of the surrounding mountains. New for the Spring/Summer 2016 season the floors have been upgraded from carpet to a wood-look hard flooring. The Great Room boasts a 46” flat screen TV with BlueRay and DVD players. The master bedroom features a brand new Smart TV with DVD player and the second bedroom has a flat screen TV (32” in guest room). A small collection of DVDs are provided and there is also satellite TV and wireless internet at the property. The dining table seats 6-8, and there are three bar stools in the kitchen. Or, open the door to the deck and enjoy the amazing view while sitting in the fresh mountain air. 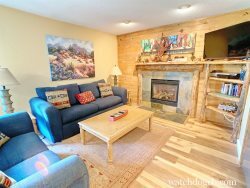 This property is in a great spot for enjoyment of all our area has to offer, and is just steps away from the free bus shuttles: hop on the condo loop to visit other friends staying on the mountain, or ride into the town of Crested Butte. Call the office at 970.349.7446 with any questions! This condo has two complimentary parking spaces. During the winter season, parking may be limited due to snow removal and storage.